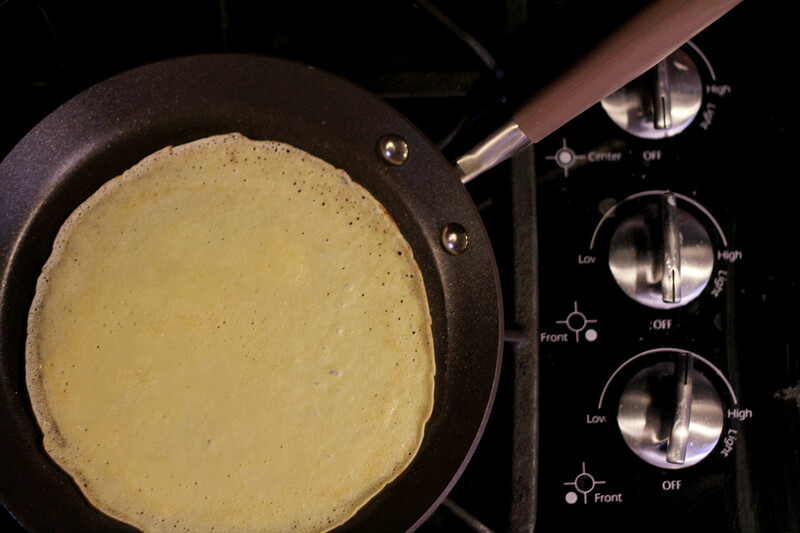 Crepes are so fun - thin little pancakes that you can do so much with. They can be sweet or they can be savory. They can be breakfast, brunch, lunch, dinner or dessert. They can be whatever you want them to be. I didn't grow up eating crepes, and the first time I had them, they were cheese blintzes. I thought they were magical. I had no idea how easy they were to make. Of course, it helps if you have a decent recipe and a good pan to work with. One of my lucky readers WILL have a pan to work with, because I'm giving one away, courtesy of Anolon. They asked me to create a recipe, so you have that, too. My recipe is a yogurt-filled crepe topped with a seasonal apple-cranberry compote. Follow the link to find it on the Anolon website. You want this recipe, particularly at this time of year when cranberries are so plentiful. The beauty of these crepes is that they're so versatile. With a plain yogurt, they're a lovely lunch crepe. But if you use a flavored or sweetened yogurt, the crepes transform into a perfect breakfast or brunch crepe. Add some whipped cream or a dollop of ice cream, and these crepes would make a lovely dessert. You could, of course, switch things around and fill the crepes with the compote and top it with yogurt, whipped cream, or ice cream, but the compote is so pretty, I thought it was a shame to hide it inside the crepe. It really wanted to be shown off. If you have extra compote, I'm sure you'll find a use for it. And then you might want to make more. Because it's really really good. As far as the pan, it's an Anolon 9.5 inch Advanced Bronze pan. It's a pleasure to use - light enough to be able to easily swirl the batter over and over and over while you're making a lot of crepes. And it's very nonstick. The crepes slide right out of the pan when they're done. And ... shhhh ... the pan is also very useful for heating or reheating tortillas. And for reheating your crepes, too. I think you'll get a lot of use out of it. If you're the lucky winner who gets one. Thanks to Anolon for sponsoring this post and for supplying the pan to the winner! The giveaway is now over. A while back, I read a quote from a chef who commented that cooking is fun because you get to play with knives and fire. I can't disagree. There's something incredibly satisfying about cutting meats and vegetables and fruits with good knives. It's a pleasure rather than a chore. So when my buddies at Virtual Potluck teamed up with WÜSTHOF, I was pretty excited about the new kitchen weapons. 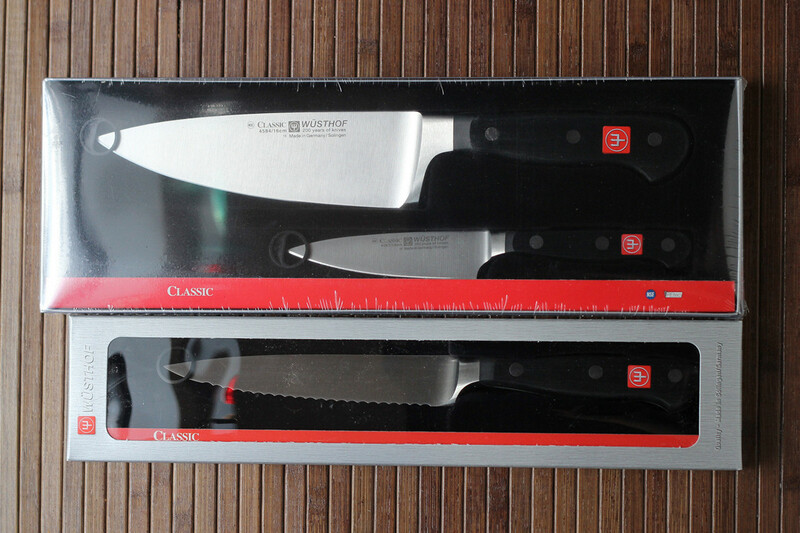 We each received the CLASSIC 5-inch Serrated Slicing Knife and the CLASSIC 2-Piece Extra Wide Chef Set that includes a 4-inch paring knife and a 6-inch cook’s knife. AND I have the same knives that I'll be giving to one of my readers. The first time I used the serrated knife to slice a tomato, I nearly swooned. I like using serrated knives to cut tomatoes, but this one is so much better than other knives I have. So much. Much like the serrated bread knife that I received as a gift to celebrate my book contract, this was a knife I didn't know I needed until I used it. Now I'm in love with it. And the other two knives are pretty darned nice, too. The wide cook's knife is great for slicing, and the width makes it wonderful for smashing garlic or scooping up what's been cut. The paring knife is sweet, too. It make peeling things much more fun, and it's also great for cutting small things, like when I'm slicing limes for cocktails. The first thing I thought of cooking that would show of the knives was fajitas. First, I love Mexican food. And Mexican-inspired food. And second, fajitas require a lot of slicing. And different kinds of slicing. I opted for steak fajitas. But what kind of steak? 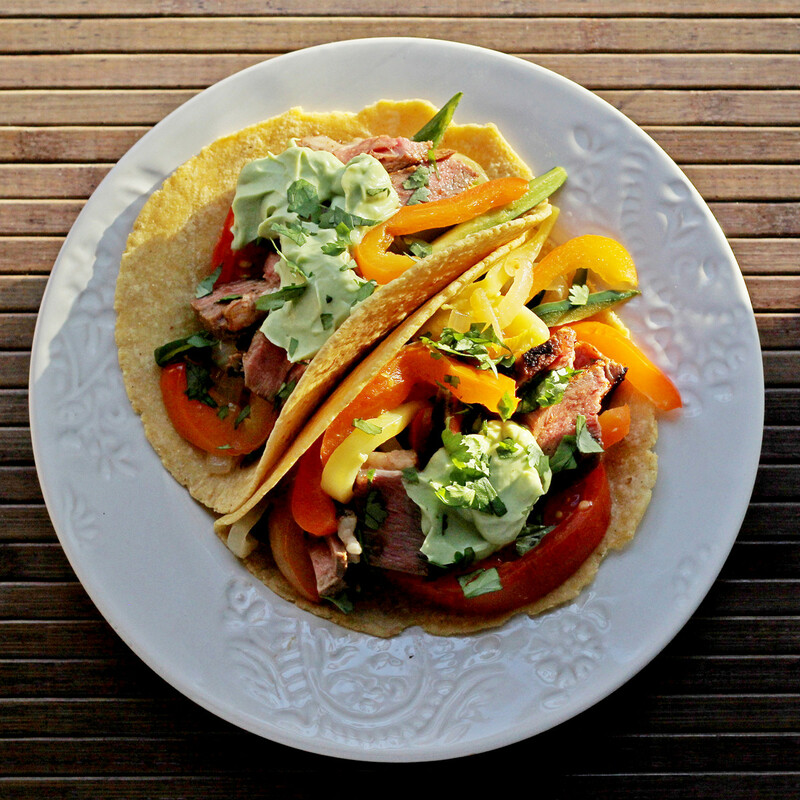 The usual suspects for fajitas are skirt steak, flank steak, or flap meat. But the secret is that you can pretty much use any kind of steak you like, as long as you slice the meat into small, thin pieces. I decided to use a boneless ribeye. I also decided to use a LOT of vegetables. Because I like them. The one thing I didn't do (that I usually do) is that I didn't go crazy with toppings. I usually end up with way too many toppings whenever I serve something in a tortilla. This time, I limited it to an avocado crema, fresh tomatoes, and cilantro. A few hours before cooking, place the steak in a plastic zip-top bag and add just enough salsa to coat the meat. Seal the bag and let the steak rest at room temperature while you prep everything else. You can also marinate the steak overnight and remove it from the refrigerator an hour before cooking. Slice the zucchini into matchsticks about 2 or 3 inches long. Core and seed the red pepper and poblano pepper and slice into similar-sized pieces. Peel the onion, cut it in half from root to stem, and slice into half-moons so the strips are about the same size as the zucchini and peppers. Set aside. Put the avocado flesh, sour cream, lime juice, and salt into a blender or food processor and blend until smooth. Slice the tomatoes into thin wedges and chop the cilantro roughly. Heat a skillet on high heat. Remove the steak from the marinade and pat dry. Rub the steak with the olive oil and place in the hot pan. Cook until nicely browned on one side, flip, and cook on the second side. Continue cooking until the steak is done to your liking. Remove it from the pan and let it rest while you cook the vegetables. Add the vegetables to the pan where you cooked the steak. You can wipe out the pan, if you like, or just let the meat flavor season the vegetables. Add a little olive oil, if necessary and season with salt and pepper, to taste. Cook the vegetables to you liking - crisp-tender is fine, and fully cooked and caramelized is just as good. It's your dinner, so make it the way you like it. Meanwhile, warm the tortillas in a dry pan, flipping them over as the heat up, until they're soft and have a few brown spots. By the time the vegetables are cooked, the steak should be rested well enough to slice into small, thin pieces. If you're using skirt or flank steak or flap meat, make sure you're cutting against the grain of the meat. Assemble the fajitas with vegetables, steak, and garnishes as desired - or serve the individual components in bowls and let people make their own. If you're looking for a knife for a holiday present, check these out! And they're easy to wrap, since they come in boxes. Or, enter below and see if you might win! Thanks to WÜSTHOF for sponsoring this post and providing knives for the giveaway (US residents only). If you want to know more, check out their website, like them on Facebook, or follow them on Twitter. Let me make one thing abundantly clear. My mother wasn't Italian. She wasn't even the littlest bit close to Italian. She was so far from Italian that I knew what ravioli was before she did. I came home from grade school all excited about this magical new food served in the cafeteria - ravioli. And no matter how I tried to describe it, she just couldn't get it. So, when it came to cooking anything resembling Italian food, it was all spaghetti. Even when it was mostaccioli or rotini. If it was served with a tomato-based sauce, it was spaghetti. And all tomato-based sauces were simply called spaghetti sauce. There was no such thing as Bolognese or marinara in our house. Nope. We got spaghetti with spaghetti sauce, even if it was fettuccini with marinara. Now I know better, but even so ... there are times when I think about making spaghetti, but end up making rigatoni instead. Because when I go see what noodles I have on hand, there are no long thin noodles. And I'm fine with that. I pretty much love noodles of all shapes and sizes. I was feeling a little bit out-of-sorts the other day and the best cure for that is nostalgic comfort food, so I decided that recreating one of mom's non-spaghetti spaghetti recipes would make me happy. In other parts of the country, this might be called hot dish or goulash. In my house, this was just one of the things that might have been served when mom said we were having "spaghetti." I used mini wagon wheels. They were one of my favorite past shapes when I was a kid. Heat a large saute pan on medium heat and add the ground beef, onion, pepper, and oregano. Add 1/2 teaspoon salt. Cook, stirring as needed until the meat and vegetables are cooked through. Add the sauce and stir to combine. Taste for seasoning, and add more salt, if desired. Lower the heat to a simmer and continue cooking, stirring occasionally, while you cook the pasta. Cook your pasta as desired, then add it to the meaty sauce in the pan. Cook for another minute and give it one last taste. Serve with grated cheese, if desired. 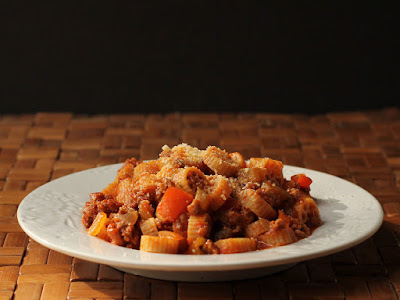 Last week, I wrote a sponsored post for Ragu with a different recipe and I used a similar Ragu sauce here, because I bought more than one jar to work with. However, this post is not sponsored. It's just a recipe. Using a jar of sauce that I bought. My buddies and I over at Virtual Potluck loved the cookbook Le French Oven so much, we decided to do a group post about it. AND we've got cookbooks to give to you. AND something else. Do you know what a French oven is? You might have one, and not even know it. According to some definitions, Dutch ovens are made from uncoated cast iron, but similar coated pots are French ovens. There are of course, French French ovens - coated cast iron pots made in France. The book Le French Oven focuses on cooking in different types of French ovens, from large ones to individual ones. I have at least a dozen pages bookmarked, with recipes I want to try. And I've made a few. But for this post, I decided to make beet soup. 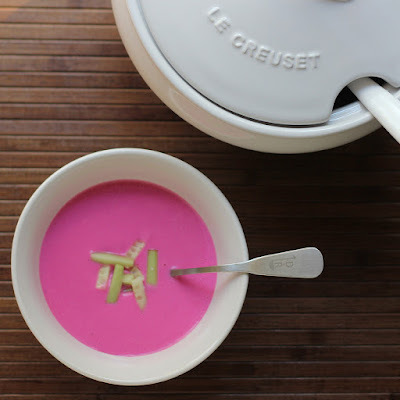 Because I love soup and I love beets, and this recipe is completely different from my usual. I usually make beet soup similar to what my mom made - a clear soup that's a teeny bit tart. Then sour cream is added at the table. Mom's beet soup could be served hot, warm, cool, or chilled. And I pretty much liked it every possible way. This soup is designed to be served chilled, and it's blended with buttermilk. A lot of buttermilk. The result it a very pretty pink soup. I had to make one little change to the recipe. It called for using beet greens as a garnish. The beets I bought at the farmers market were end-of-season beets, and the greens were really beat up. They weren't really appetizing either as garnish or in the soup. So, while I made the rest of the recipe according to the book's instructions, I made a different garnish. While I didn't make the garnish this time, I do like the idea of floating a "salad" on top of the soup. I might give it a try next time I have pretty beet greens. If you have pretty greens, this includes those instructions, but I'll include my variation as well. Just in case. Wash, trim, and peel the beets - wear rubber gloves if you don't want to stain your hands! Place parchment or wax paper on your cutting board if you don't want to stain it. Coarsely shred 2 beets and set aside. Slice the remaining beets into large pieces. Pull the leafy part of the leaves off of the thick stems and discard the stems. Finely chiffonade the greens so you have a tightly packed 1/2 cup. Use any remaining greens for whatever you like. Place the sliced beets in the French oven with enough water to cover. Add the lemon juice and bring to a boil. Reduce to a simmer and cook the beets until they are tender - about 40-60 minutes. Drain the beets. When the beets are cool enough to handle, put them in a food processor or blender, in batches if necessary, with the buttermilk, sugar, 1 teaspoon of salt, and pepper. Blend until very smooth. Pour the finished puree back into the French oven. Taste for seasoning and add more salt and/or pepper, if desired. Cover the French oven and refrigerate until the soup is chilled. 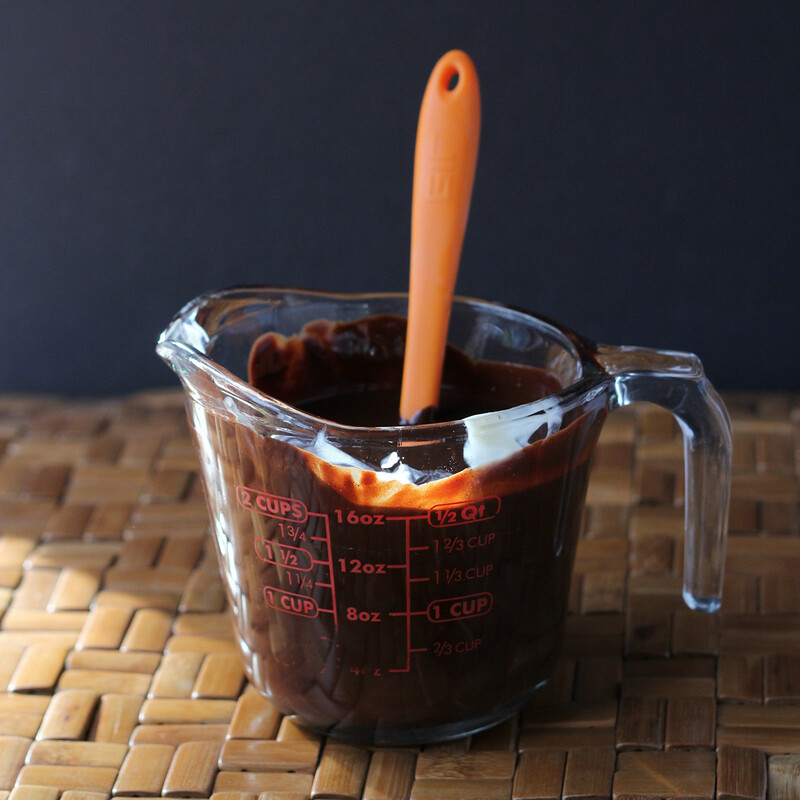 Just before you're ready to serve, whisk together the oil, 1/4 teaspoon of salt, and vinegar. Toss in the grated beets and the beet greens. Mix well to coat. 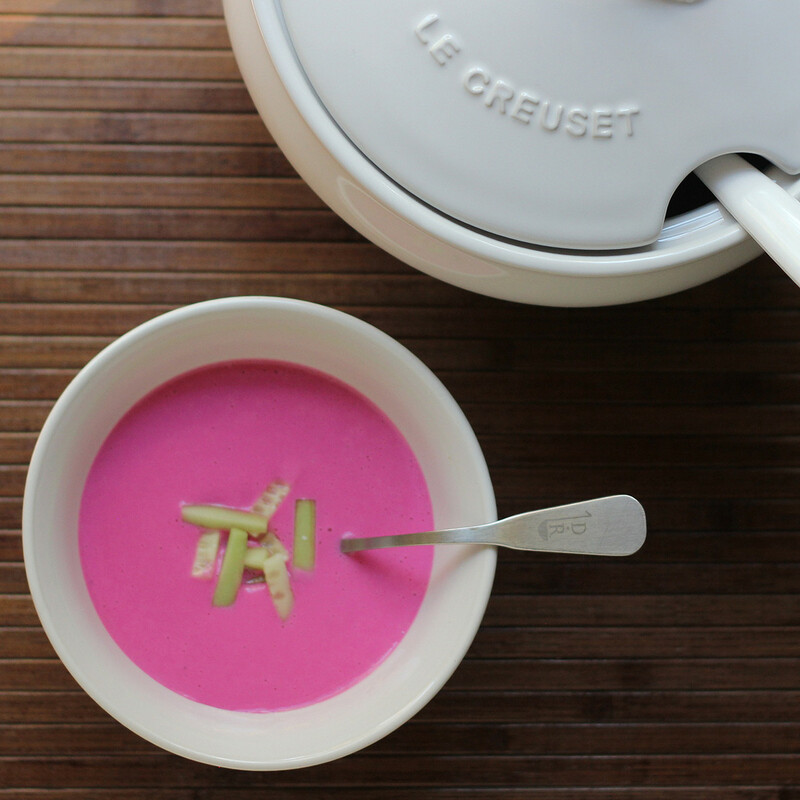 Serve the soup in bowls and top with the beet salad. Note: Since my beet greens weren't edible, I garnished with peeled and julienned cucumber pieces instead. All of the participating members of Virtual Potluck received a copy of the book from the publisher as well as a serving item from Le Creuset; I got the soup tureen shown in the photos. The publisher is providing books for the winners as well as an oval Dutch oven for one winner. The nice folks at Smirnoff challenged me to make a cocktail using Smirnoff Ice, celebrating my football team. The first decision was figuring out which team was "mine." I grew up in Bears territory and moved to Broncos territory. Funny thing is that the major color in both logos is orange. So this really pays homage to both teams. I chose to use the Screwdriver flavor of Smirnoff Ice, because it was pretty close to the orange color I wanted. To darken the color, I added a splash of cranberry juice. And then I had some fun with the blue color from the Broncos logo. The ice cubes - or actually spheres - were blue. How easy can it be? Fill the glass with ice, add the Smirnoff Ice, and add a splash of cranberry juice to darken the orange color of the cocktail. *I turned my ice cubes blue by freezing butterfly pea flower tea , which is a natural blue color. If you don't happen to have that tea on hand, you can use blue food coloring. Or, of course, you can use plain ice cubes. But blue is fun, right? The nice folks at Smirnoff Ice send me product and funds to purchase ingredients for this post. When I got an opportunity to do a post that involved baking with chocolate and other goodies ... well, how could I say no? I love baking, and chocolate is so ... chocolate. I mean, what more can I say? I decided to make brownies. But not any brownies. These have caramel bits and walnuts inside, and a puffy-gooey colorful splash of marshmallow on top. 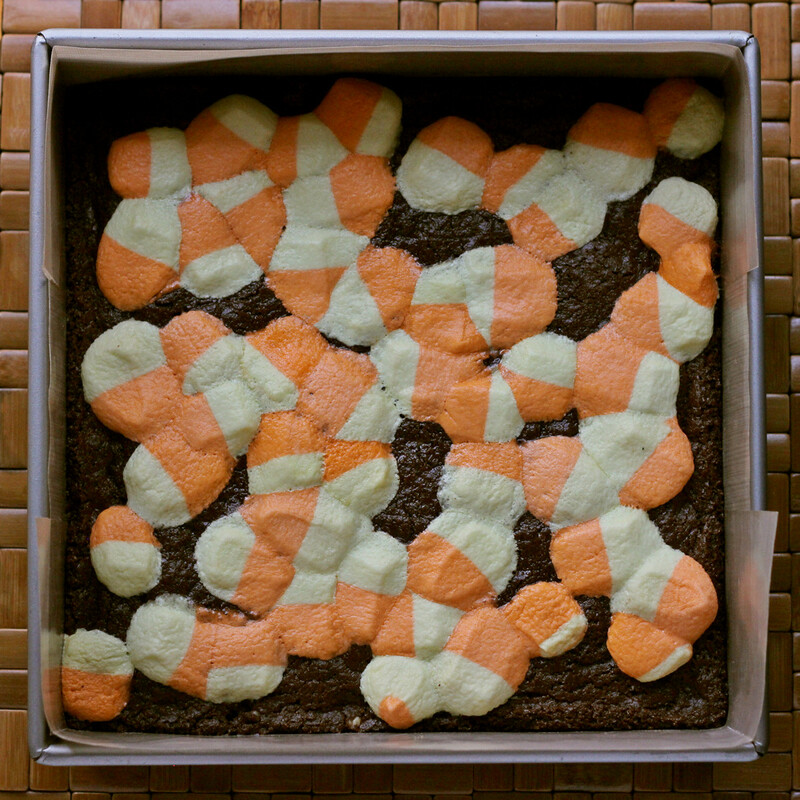 At first, I wanted to use the marshmallows inside the brownies, to get the colors to show inside, but that didn't work as expected. The brownies were delicious, but the marshmallows melted and the colors mostly disappeared. So then I decided to top the brownies with the marshmallows, so you could see them. See what torture I go through for you? Brownies had to be consumed. Okay, and I gave some away, too. But still. 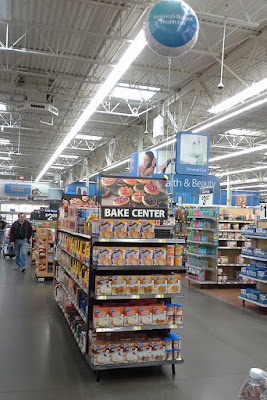 I picked up my goodies at the local Walmart where a "Bake Center" display was conveniently positioned in the middle of the big aisle in the grocery area. Like a beacon of ... baking to come. 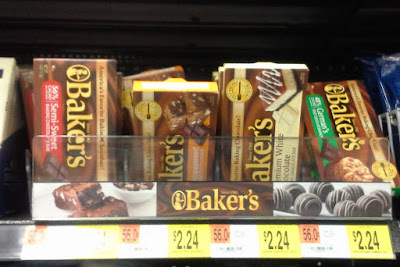 I swear, I always gawk at the stuff in the baking displays, even if I'm not shopping for baking stuff. Do you do that too? I just have to stop and browse. Have to. I had a whole list of products I could choose to use, and I was supposed to pick at least three for my actual recipe. I narrowed it down to some Baker's chocolate bars (I stocked up on white, semi-sweet, and unsweetened chocolate bars, because I use them all the time) and then I added Kraft caramel bits, because I thought they would be fun, and then I hunted down the Jet-Puffed Candy Corn marshmallows because I thought they'd be pretty. While candy corn is probably most associated with Halloween, the colors of the marshmallows were very fall-like and just as appropriate for all the days leading up to Thanksgiving. And, hey, why not have some brownies for Thanksgiving dessert, too? I kind of love this recipe. It's simple to put together and it freezes well, so you can make extra and have them on hand if someone drops by for coffee or if you need an emergency dessert. And while these look like something that came from a fancy bakery, they're budget friendly, so you can make them often! Did I mention they're very dense and very fudge-like? I prefer to eat them just a little bit chilled. But that's just me. They'd probably be amazing if they were just a little warm, and then topped with ice cream. Or at room temperature. Yeah, they're that good. Since they're so rich and luxurious, a little goes a long way. I suggest cutting them in smaller pieces rather than ginormous ones, like you'd do for a cake - at least 16 pieces - or even more. I cut my second batch into 36 pieces, each about 1 3/4-inch square. Possibly too small for dessert, but perfect for a little snack. To make removing the brownies from the pan a little easier, I suggest lining your baking pan with parchment. Line a 9-inch square baking pan with parchment paper. Preheat the oven to 325 degrees. Melt the butter and chocolate in a double boiler on the stove, or in the microwave in a microwave-safe container (I used a measuring cup) in 30-second increments, stirring in between heating, until the chocolate and butter are fully melted. Stir until they're combined. Meanwhile, put the sugar, flour, baking powder and salt in a large bowl. Whisk to combine. Add the melted chocolate to the dry mixture and beat well. Add the eggs and beat until combined. Add the walnuts and stir until the walnuts are evenly distributed throughout the chocolate mixture. Note: you could add the caramel bits along with the walnuts, but I found that it was easier to make sure they were evenly distributed when I layered them in the center. But it works either way. Put about half of the mixture in the pan and press it evenly into the pan. It is very thick. Don't worry about that. 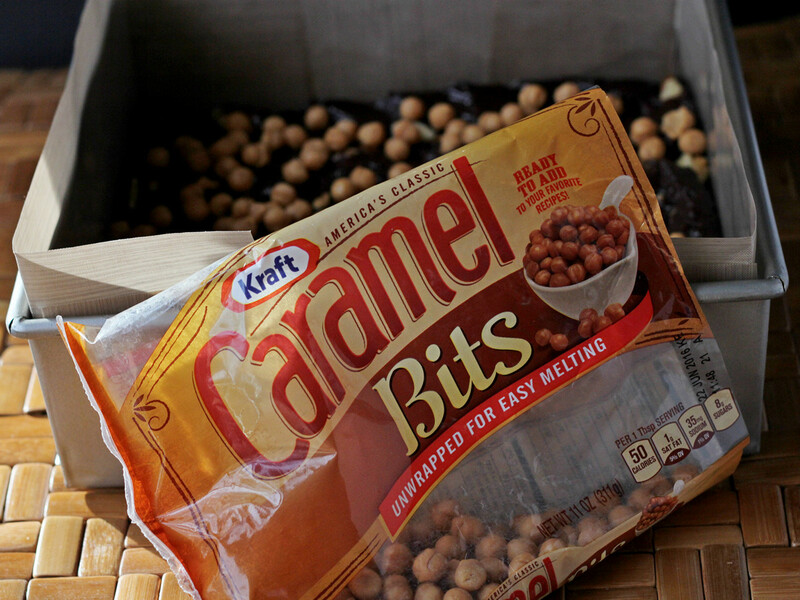 Sprinkle the caramel bits evenly on top of the chocolate. You can add more, if you like. Add the rest of the chocolate mixture to the pan and press it evenly on top of the caramel bits. Bake at 325 degrees for 35-40 minutes, until the edges of the brownies are fully set and the center has just a tiny bit of jiggle to it. It shouldn't be sloppy, but it's fine if it moves a bit. Take the pan out of the oven and sprinkle the top with the marshmallows. You don't need to measure exactly - just scatter on as many as you like. Keep in mind that they'll flatten and spread out as they melt. Scatter the chopped white chocolate on top, if you're using it. Return the pan to the oven and bake for an additional 10 minutes until the marshmallows have softened and melted. Mmmm. Because of the fudgy nature of these brownies, you won't be able to test them with a toothpick, as you would for a cake, but they should be set in the center (no more jiggle) when they're done and the edges will be slightly crisp. Let the pan cool completely on a rack before removing the brownies. I suggest refrigerating them before slicing, for neater looking cuts. You can make these brownies well in advance and freeze them. Remove them from the freezer and let them rest a for a while at room temperature, so they can soften enough for slicing. The marshmallows and caramel bits also make nice snacks all on their own, so it would be perfectly fine to scatter some on the plate with the brownies or have them sitting in bowls on your dessert bar. 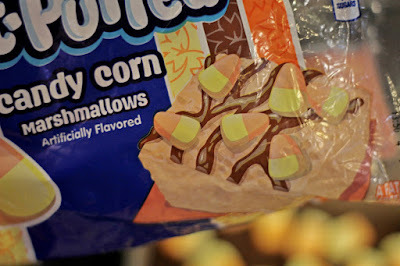 Note: If you can't find the candy corn marshmallows, you can use regular mini marshmallows or any seasonal or colored mini marshmallows that you like. For more info on the products I used (YUM! 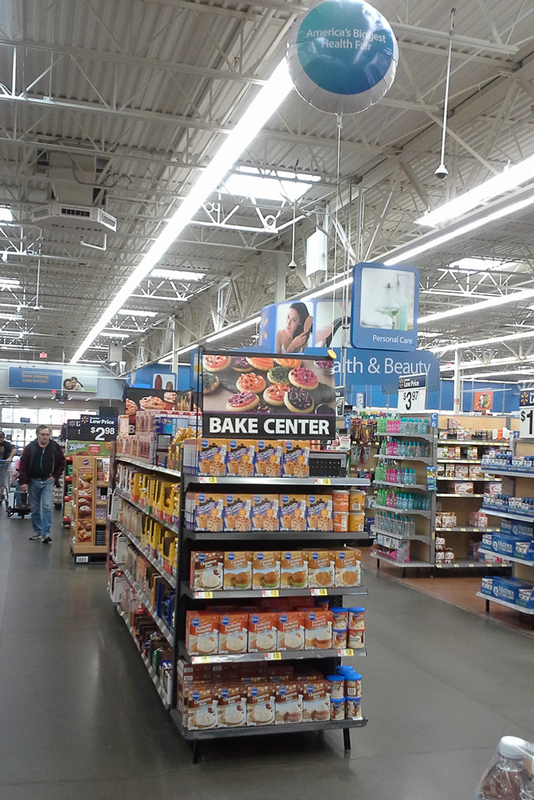 ), more recipes, and a COUPON for Kraft products at Walmart, check it out! You've heard of mulling spices, right? You can make your own mix, but I got some from Frieda's Specialty Produce that's really good - and convenient. I used to be opposed to spice mixes, but lately I've realized that they're really handy to have on hand. Instead of pulling out 8 bottles of spices, I can just grab one jar. So, anyway, my neighbor had just given me a whole bunch of limes. My first thought was that I wanted to make some lime-pickled red onions. They're one of my favorite things. I put them on tacos, salads, and sandwiches. So darned good. Usually I make my pickled onions very plain - lime juice, a tiny bit of salt, and red onions. And that's it. But I couldn't get it out of my head that I should try the onions with mulling spices. So I did. And they were really good. The only thing I'd do different next time is wrap the spices in cheesecloth or put them in one of these so I didn't have to pick the spices out of the onions in the bottom of the jar. Put the mulling spices in a quart jar (wrap in cheesecloth, if you like) and add the salt. Pack the sliced red onions in the jar. The more you can jam in there, the less lime juice you'll need to fill the jar. Fill the jar with lime juice. Cover the jar and refrigerate. The onions are ready when they're an even bright pink color. It usually takes 2-3 days. Serve as desired. 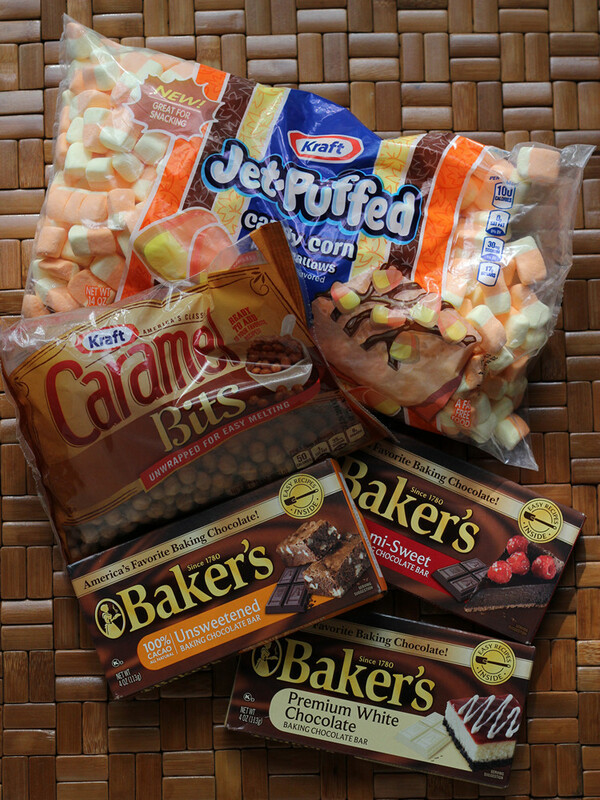 I receive products from Frieda's for use on my blog; you can find their products at your local grocery store. 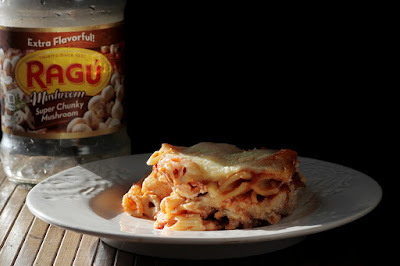 Note: This is a sponsored post for a pasta sauce, but the words and recipe and photos are all mine. 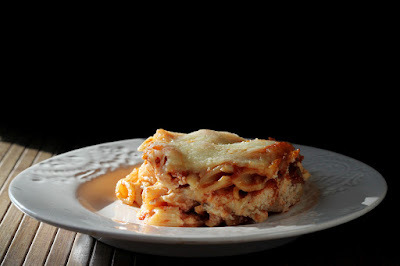 I still remember - vividly - the first time I tasted lasagna. I was about 9 years old, and my mom and I, along with my mom's lady friend, had been invited to dinner at the apartment of a single fellow who happened to own the local grocery store. He was making lasagna. I'd never heard of it before, but I was pretty much interested in any kind of Italian food. So I was more than happy to be there. The truth was that mom's friend was the one who was invited to dinner, but it wasn't proper for a lady to visit a man's apartment by herself, so mom and I tagged along. I realize that now. Back then, we were just going to dinner. I have no recollection of what else was served, but when that lasagna hit my plate with the beautiful layers, I was intrigued. When I took my first bite, I might have heard angels singing. I know I had a second helping. Perhaps a third. I might have eaten more than any adult at the table, and if I could have figured out a way to run out the door with the leftovers, I might have done that, too. I was in love. As far as I know, that was mom's first experience with lasagna, too. Although I begged her to make it for us, she never did. I don't know if it was simply too much trouble or if it was that she had no idea how to make it. But every single time I saw lasagna on a restaurant menu, that's what I ordered. And I knew that when I was old enough, I was going to make lasagna. Eventually, I did learn how to make lasagna. I tweaked the recipe and I made giant batches, enough to feed entire neighborhoods, because it really was a project. If I was going to make it, I might as well make a whole lot of it. Some to eat, some to freeze. These days, my lasagna-making is usually reserved for special occasions, but that doesn't mean I've abandoned it entirely. This layered rigatoni dish has the flavors of lasagna, but it's simple. Very simple. And by using jarred Ragu sauce , it takes very little time. Just look at the layers! 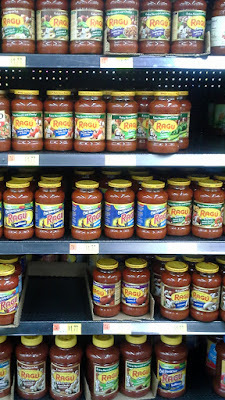 My mom used Ragu Pasta Sauce quite often, and like many other things that I grew up with, I didn't think a whole lot about the history of the product. It was just there. I probably never would have looked it up, but I got the info as part of this sponsorship. The company was founded by a woman named Assunta Cantisano, who came to the US in 1914 - just a little bit before my mom was born. 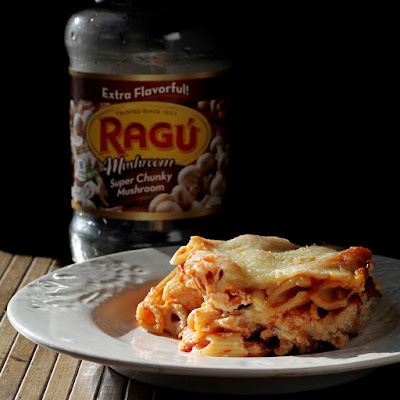 Later, during the depression, Assunta started selling her home-made tomato sauce to her neighbors, and pretty soon that turned into the company we know as Ragu. By the time I was born, Ragu was everywhere. Even my mom's kitchen. Back then, there were a lot fewer flavor choices in the Ragu brand. Now there are a lot of different options, including chunky, smooth, meaty, and a whole lot of others. Do you use Ragu? Which ones do you like? Oh! If you're worried about what's in a jar of sauce, Ragu has no artificial flavors and no HFCS. There's a contest running on Food.com called Ready. Set. Cook! They're asking you to create new and unique recipes featuring Ragu sauce and using a set list of other ingredients. Go check it out and maybe you can win something. I like it when my readers win stuff! Heat the oven to 350 degrees and have an 8- or 9-inch baking dish standing by. While you're cooking the pasta, combine the ricotta and eggs in a small bowl. Mix until well blended. Mix until well combined. 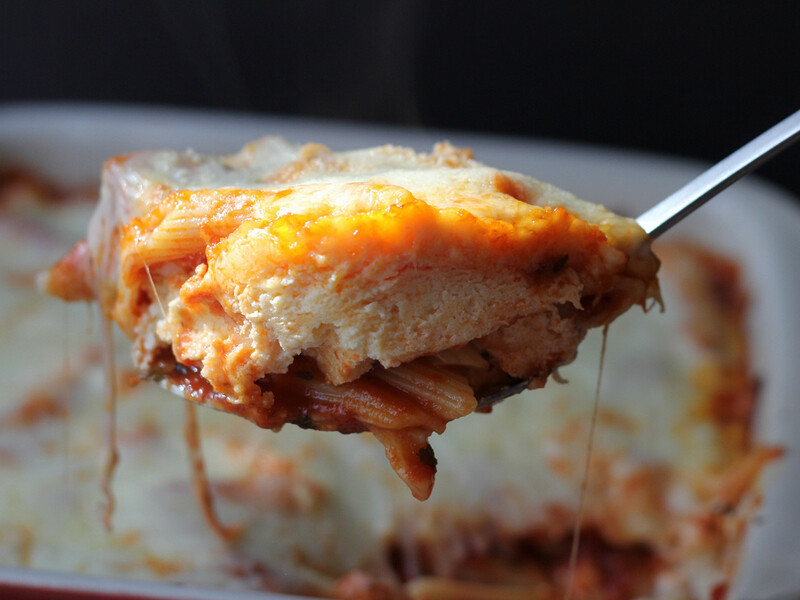 It might be a little soupy - that's fine, the pasta will absorb some of the sauce as it bakes. Put half of the sauced pasta in the baking dish. There should be enough to cover the entire bottom of the dish. Add the ricotta mixture to the baking dish in an even layer. Top with the remaining pasta and sauce. Sprinkle the cheese on top of the pasta in an even layer. You can add more or less, to taste. If you like, sprinkle some parmesan or romano cheese on top. 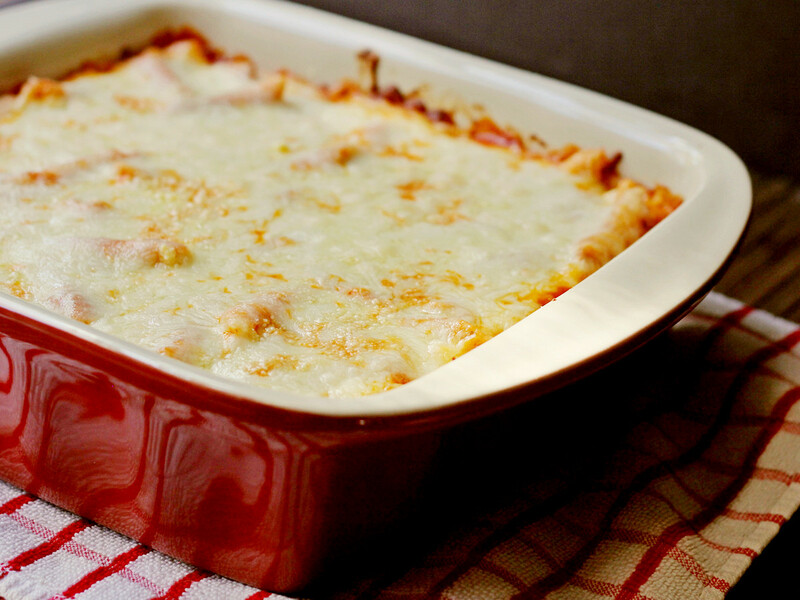 Bake the pasta at 350 degrees until the cheese is melted and brown in spots, and the sauce is bubbling around the edges, about 30 minutes. Remove the baking pan from the oven and place it on a trivet or folded kitchen towel (it's hot!). Let the pasta rest for 5 minutes or so before serving.